Four McCathern Dallas attorneys selected to D Magazine's Best Lawyers in Dallas 2016 list. Four McCathern Dallas attorneys represent the excellence of McCathern’s diverse practice areas and are deservedly recognized for D Magazine's Best Lawyers in Dallas 2016 honor. We are honored to be selected as some of the best attorneys in Dallas by D Magazine. Congratulations to McCathern Dallas Partners Arnold Shokouhi, Jennette DePonte, Carl Evans, and Of Counsel attorney, Luis Bartolomei, on being selected to D Magazine's Best Lawyers in Dallas 2016 list. An elite group of top-notch lawyers in Dallas received D Magazine's "Best Lawyer" honor this year. These listings were determined through a peer-review voting process with ballots submitted by thousands of local lawyers. The final list was determined by an evaluation from a panel of eminent lawyers. 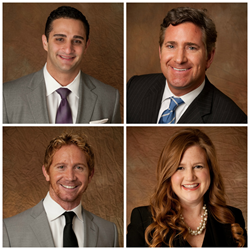 McCathern's four selected attorneys are listed in D Magazine's May issue. Arnold Shokouhi currently practices in the area of commercial, director and officer liability, and employment litigation. Arnold also heads McCathern's Banking and Mortgage section, and has extensive experience in the mortgage banking industry. His section handles everything from drafting mortgage documents to dealing with state and federal compliance matters for financial institutions and service providers. Additionally, his experience handling transactional matters has given him the ability to effectively filter through the intricacies of complex commercial litigation matters. Arnold has played a critical role in the litigation of multi-million dollar disputes between billion dollar corporations. Arnold’s experiences allow him to represent both small and large clients in the commercial and employment litigation arenas. Jennette E. DePonte, Partner at McCathern, has extensive litigation and trial background, having tried numerous cases in state and federal courts in Texas. Her practice focuses on litigation involving employer-employee relations. Specifically, she has litigated tort and non-subscriber claims, employment-related torts, ERISA claims, discrimination, harassment and retaliation claims, wage and hour claims and collective actions, and civil rights claims under state and federal law. Carl Evans is an equity partner in the firm that practices in the areas of non-subscriber employer defense, trucking, liquor liability, employment, commercial, construction, subrogation, tort and insurance litigation. Mr. Evans has an extensive litigation and trial background, having tried numerous cases in state and federal courts. Mr. Evans has also obtained defense verdicts in arbitrations involving claims of fraud, negligence, breach of contract and breach of warranty. Additionally, Mr. Evans has successfully represented numerous clients in summary judgment motions that have included claims for bad faith, fraud, negligence, premises liability, breach of contract and breach of warranty. For more than 20 years, Luis Bartolomei has been committed to helping clients who have been seriously injured by careless drivers, dangerous products, negligent employers, and reckless companies. During that time, Luis has been lead counsel in over 60 jury trials throughout the state of Texas. This commitment has earned him a reputation as one of the best trial attorneys in our great state. Luis has a unique cultural and educational background, which has made him successful in large cities, small towns, and many counties, both liberal and conservative, throughout the state. He has represented thousands of clients, generated millions of dollars in settlements, and been consulted by news agencies for his expertise in products liability and personal injury matters. McCathern, PLLC provides high-quality legal services to clients across the nation with a broad range of practice group specializations. Each of the firm’s leaders brings large-firm experience and business acumen to a smaller-firm environment of agility and efficiency. McCathern's philosophy of improving people’s lives is implemented daily by treating clients as business partners, working together to find the solution to a dispute, or to close transactions in a diligent, cost-effective manner. The firm's track record has attracted an impressive clientele list, ranging from Fortune 500 corporations and high-profile organizations, to small companies and high-net-worth individuals. McCathern's main firm location is in Dallas, Texas, with additional locations in Houston, Texas and Los Angeles, California. Visit http://www.mccathernlaw.com for more information.